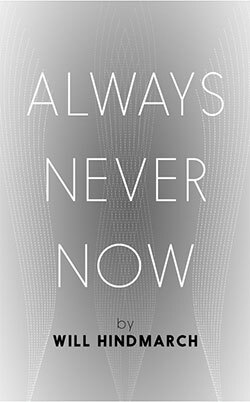 Always Never Now by Will Hindmarch successfully fuses cyber and punk, augmenting Lady Blackbird's system and adding twists. Split into player's handbook and scenario for the GM, it's deep, familiar and exceptionally well thought through. Good writing draws you into the dark world of mega-corporations that - worryingly - is starting to look like our own. Like it's inspiration, Always Never Now is billed as a single scenario but I think that plays down the huge amount of gaming it will spawn. 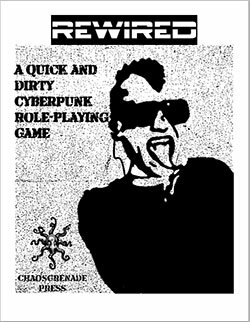 Always Never Now comes with six pre-made character that build a refreshingly interesting cyberpunk team: ex corporate security, counter-intelligence ninja, inter-corporation operative, spy infiltrator, engineer tank and paramedic surgeon. The balance is excellent between them; each are handy in a fight and there is enough separation and overlap to make a subset selection work as well as a whole team. Having spent years cajoling the misanthropes around my table to build a coherent team, I bow to the masterful balance. 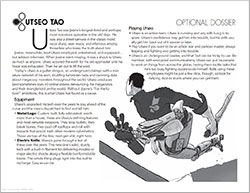 The descriptions are excellent and character imagery (funded by successful Kickstarter) are apt and excellent. Players will have these character sheets on the table during the whole game, so making them evocatively beautiful is very important. Always Never Now takes Lady Blackbird's rules and performs back street bionic augmentation. For those unacquainted with Lady Blackbird, it combines the semantics of words that describe your character and die rolls. 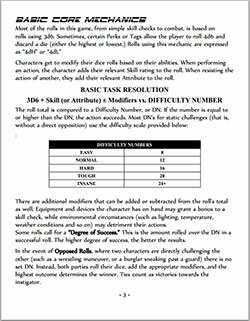 Your character has a number of traits, broad descriptions of a skill area. Each trait has a number of tags, which are more specific things that character can do. For example, the Trait Infiltrator has the tags Stealthy, Perceptive, Quick, Subtle, Agile etc. It is up to the player to negotiate for as many dice as possible. When a player needs to perform an action, they begin with a single die (any will do) and add one extra die for the appropriate trait and then another for each appropriate tag. 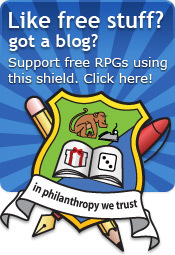 Each die has a 50/50 of being a success (use 4+ on a D6, or odds/evens or your choice!). Difficulty is set by the number of successes you need. When you fail an action, the GM will assign you a condition, one of: Angry, Exhausted, Impaired, Hunted, Trapped, Recognized. These drive the narrative, adding flavour to the story. Each Character also has a Key, which is a facet that is particular to that character. When you use that Key during play, then you pick up experience points to spend later. An example key is Key of the Comedian, the character makes jokes and when they're funny - they get an XP. Finally, each character gets an Edge that they can use once per session to help die rolls in certain situations or steer the narrative. The rules are well explained and the examples are both informative and setting-flavoured. Story games that fail to incite story trigger an allergic reaction in me. Always Never Now requires no anti-histamine. The scenario file that accompanies the player file is a complete adventure that you can pick up and run straight away. This is the crux of Always Never Now - there is a lot to read but it's so well written that it is a joy. There is a little fat to trim in the player file but it never gets in the way. The scenario is formalised and organised into a series of scenes. 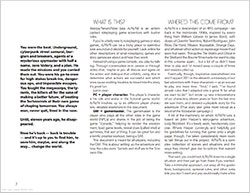 After each scene, the players can choose from a number of new scenes depending on the clues they uncover. They can also have a recovery scene where they plot, plan, rearm and get ready to punk it up some more. 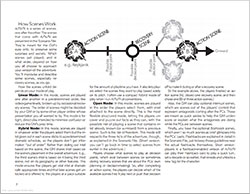 Coupled with a neat diagram that acts as an in-game aide-mémoire, it's a neat way of presenting a scenario to a GM. A simplified Choose Your Own Adventure. The setting is luscious. Twisting and embellishing the familiar, regressing some aspects and progressing others (the secret of good cyberpunk). Technocracy are a ruling elite, driven by complex whims and power thirst. Megacorps and subsidiaries sprawl over a broken earth and a good balance of available technologies. The opening paragraph in the introduction is one of the best I've ever read. The cover of Always Never Now does not adequately represent the high quality of the insides and for me, that's a problem. After click download, it's the first thing that the a prospective GM is going to see and they really should be more WOW'd by it. I'd make a montage of the character art at the very least. The long form of writing is difficult to use as a reference; a contents/index would help, as would more sub headings and better marked examples. I wonder if some might not get the movie references, so I would hyperlink those to Wikipedia. There's a neat description of roleplay for newbies but as I imagine that 90% of the readers will have played before, a quick jump link to the story game specific stuff would be handy. I like the descriptions of Details, Beats and Moments as a description of building a successful scene but the writing gets a little fluffy round there and I think tightening it up would make it easier to understand. On first read through, it feels like rules bloat when it isn't at all - just putting definitions on techniques to help those people who have not had much control over the narrative before. One-shots might put you off but Always Never Now is no ordinary one-shot. 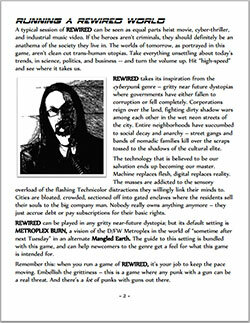 It's a self-contained cyberpunk campaign that is ready to print-and-run. The standard of writing is high, which is vital for a good story game and although it might need a little boiling down in places, the depth and breadth of setting is a delight. If you have a bubbling interest in running a story game, then Always Never Now is an excellent choice. Thank you to Will for sharing.